Click here to read this in PDF form. Governments and state agencies tend to look upon the residents of low-income neighborhoods as resource consumers, as people for whom the agencies must provide -- and not as people who can contribute something to their neighbors. Community asset-mapping flips the traditional perspective on its head. Instead of resource consumers, residents are seen as potential resource producers. A retiree becomes a mentor or tutor. A mechanic teaches children how to tune cars. And an artist offers a wealth of knowledge, energy, and passion to any child who expresses interest. Understanding and appreciating the assets communities have to offer is only the first step toward building positive community-based programs for children. This guidebook helps you put the principles of community asset-mapping into action. Every day in communities across the state, ordinary Alabamians step up and give part of themselves to others. We see it in the volunteers in soup kitchens, the Sunday school teachers in our churches, the legions of us working to rebuild our state after devastating tornadoes, and in the tens of thousands of Alabamians who serve in our country’s armed forces. Millions of private and individual decisions combine to have a greater impact, positively affecting friends, neighbors, even complete strangers. Although volunteers may begin their work for selfless reasons, they eventually realize that they, too, benefit from their efforts. Through service, we discover communities that embrace us, churches to belong to, and a vibrant citizenship that pervades all aspects of our lives. Service and cooperation allow Alabamians to take hold of the future of our communities, our state, and our nation, especially during difficult times. 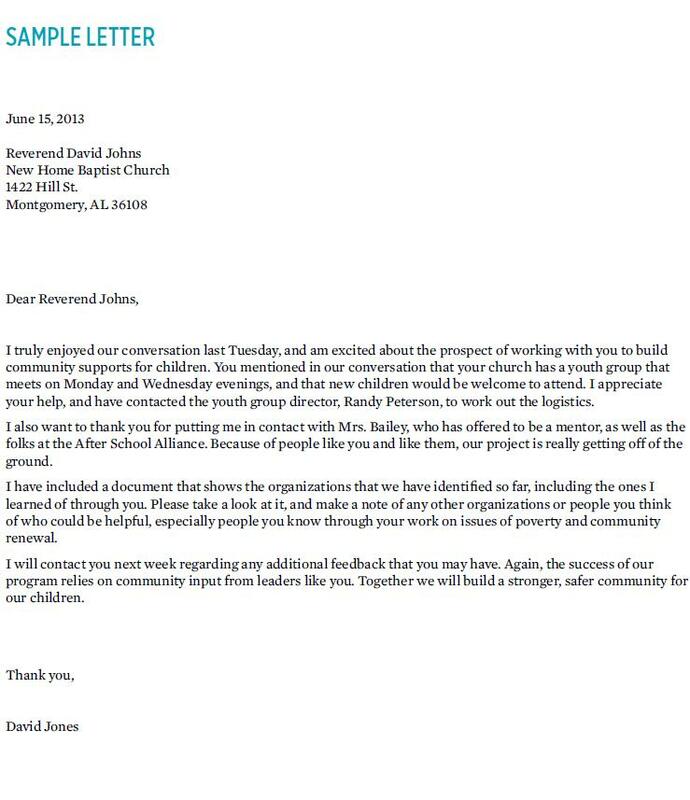 Now, with the state facing falling revenues and cuts to services, Alabama's churches, neighbors, and volunteer groups have stepped up to help out, greatly expanding their charitable giving and contributions. Our willingness and proven ability to come together and solve problems, whether local or national, is part of what makes us uniquely American. Yet there are also hundreds of thousands of us who have not yet found a way to give back, who are not reaching our full potential as citizens, neighbors, and friends. It is not for want of desire, motivation, or willingness. The reason so many of us fail to give back to our communities is that we simply don’t know how. While so many of us wait on the sidelines, thousands of children go without the resources they need to flourish — positive role models, safe places to go after school, healthy activities to participate in, and adults to help them with their homework. Children without these resources struggle in school and are likely to drop out. Because they lack the resources so many take for granted, these children are on a fast track to poverty and, all too often, incarceration. As people who care about children and the health of our communities, we face two distinct challenges: 1) children are not getting the human capital — the time, knowledge, passion, skills, and attention of adults — that they need to succeed; and 2) adults are struggling to find opportunities to contribute to their communities in meaningful ways. We can solve both problems at the same time by unlocking new opportunities and spaces for adults to work positively with children, and building an infrastructure that lets a community provide its children with the resources and attention they need. People — not governments, courts, or other agencies — are the solution to the problems children face. Courts in particular, which extend one helping hand while holding child-sized handcuffs in the other, often ending up hurting the children with whom they come into contact, despite their best intentions. Though they cannot solve the problems on their own, government and courts can create spaces that invite and empower communities to help themselves. Court involved children, like all children, are better off when they can live at home and draw strength from their families, when they get the services they need in their own communities, and when they participate in healthy activities. Communities are full of resources that can be directed to meet these needs. Your role is to find these assets and connect the dots. This guidebook is a roadmap to a process known as “community asset-mapping.” It's an odd term, but it translates to positive action. Community asset-mapping rejects the habit of describing communities by listing their problems. Too often, the neighborhoods and communities whose children are involved in the juvenile justice system are defined solely by their needs. Unemployment, drug abuse, poor and ineffective schools, crime, and poverty are often seen as defining the communities in which many of our children live. Instead of focusing on the deficits, community asset-mapping focuses on the hidden wealth that exists in all communities. Churches, local businesses, non-profit organizations, voluntary associations and parks are all assets with valuable resources to offer. Retirees, artists, musicians, and ordinary youth and adult residents can contribute their individual gifts and passions. Many of the resources that exist in low-income communities have gone unnoticed by government and people interested in building communities. Governments and state agencies tend to look upon the residents of low-income neighborhoods as resource consumers. They are people for whom state agencies must provide, not people who can contribute something to their neighbors. These traditional viewpoints offer no space for residents to step up, be proactive, or take control of their communities and continue a cycle of dependence on public resources. Community asset-mapping flips the traditional perspective on its head. Instead of resource consumers, residents are seen as potential resource producers. A retiree becomes a mentor or tutor. 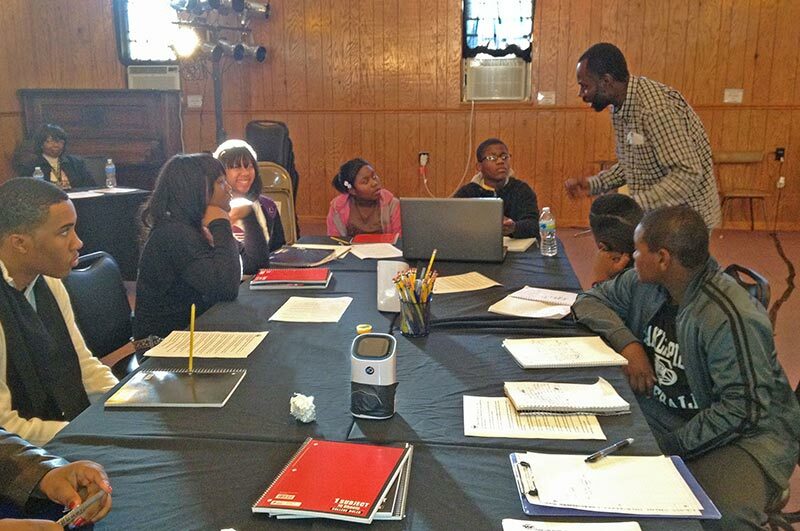 A mechanic whose business is going through hard times can teach children how to tune up cars. And a struggling artist offers a wealth of knowledge, energy, and passion to any child who expresses interest. Understanding and appreciating the assets communities have to offer is only the first step toward building positive community-based programs for children. This guidebook helps you put the principles of community asset-mapping into action, breaking the process down into four sections: LOCATE, SURVEY, DISCOVER, and UNLOCK. The LOCATE section will help to focus your work. In this section, you will learn how to identify the neighborhoods and schools, where a community-based program would have the greatest impact. You will also begin to explore the types of programs or services that would be most beneficial to the children in your area. The guidebook then moves on to gathering information from the people around you. As active members of the community, your friends and colleagues already know some of the organizational assets your community has to offer. SURVEY gives you easy-to-use tools to reach out to people in the know, solicit their input about assets you may not know about, and helps you organize the information they provide. While SURVEY identifies the assets that are already known by you and your colleagues, DISCOVER guides you through the process of finding organizations, associations, churches, and groups that have so far existed under the radar. You will explore documentary sources, go to where groups meet, and make contact with community leaders to discover the organizational assets that lie just beneath the surface. You will discover groups and programs that already work with children, and which can be persuaded to expand their roles. The contacts you make in this phase will be key to your efforts to solicit individuals who can volunteer and contribute. UNLOCK, the final section of the guidebook, uses the technique of “targeting by association” to contact the individuals who will help you build community based programs from the ground up. Once you contact individuals, the SKILLS CHECKLIST assists in identifying what they can contribute. UNLOCK concludes with advice on how to build new programs with information you have gathered. UNLOCKING YOUR COMMUNITY’S HIDDEN ASSETS provides a roadmap, but it is up to you to travel the road. No guide can foresee all the challenges you will face nor all the blessings you will encounter as you move forward. You will have to work around challenges as they present themselves, and change tactics to take advantage of unforeseen opportunities. Don’t be discouraged if many of the roads you go down turn out to be dead ends. Some churches will not be welcoming, some community members will be unwilling to contribute, and some of your interactions will be downright frustrating. Be persistent, press on when you encounter minor failures, and break your work down into manageable tasks. The resources you need are under your nose. Use the guidebook to find them, mobilize them, and direct them to serve children safely, efficiently, and effectively within their communities. Isaac White, Sr., who runs a barber college in Mobile, Ala., uses his expertise and experience to help youth in need of employment. 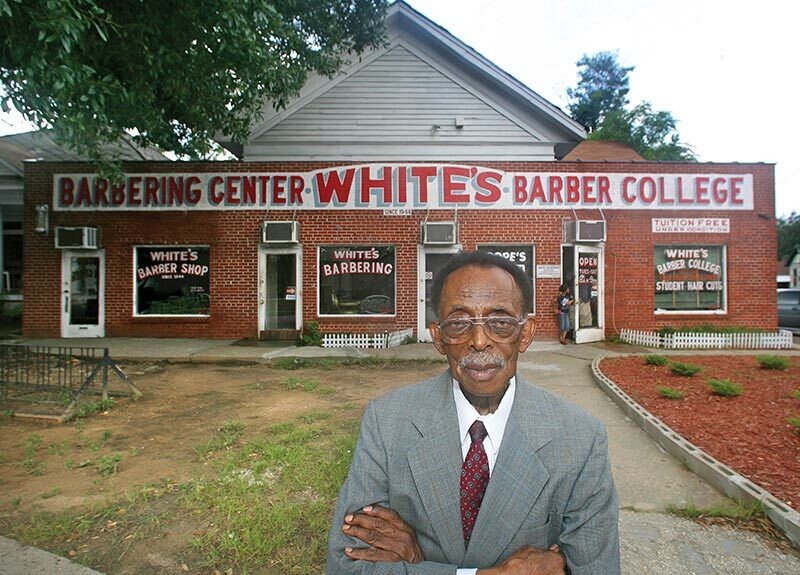 White waives the $3,500 tuition fee at his barber college for students who sign a contract saying they will abide by certain terms. The contract calls for students to complete 1,500 hours of training, pass all tests and work for at least three months after graduation in a licensed barbershop. Students who sign up also agree to dress appropriately and act respectfully. Saying “sir” and “ma’am” is an expectation. Revenue for the program comes from the $6 to $9 customers are charged for haircuts. But White, 93, also uses money from his Social Security check to help cover expenses. Where are your neediest children? What do those children need to be successful? The first step in community asset-mapping is to locate the community you will work in. You need to develop and find assets where children can access them. A “community-based” mentoring program will have little success if it is located miles away from the children who need it. The most effective way to LOCATE your work is to gather data on children in the juvenile justice and child welfare systems. 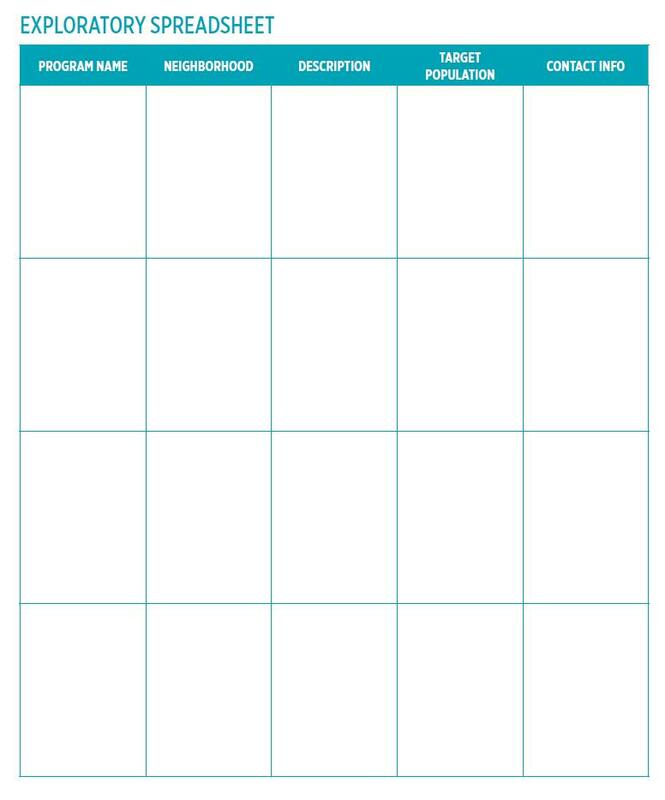 Use any resources that exist to complete the LOCATION SHEET on page 9. Don’t worry about details or get stuck on any one question. In the first column, just give your best guess; use the second column too if you have a data resource that can confirm your guesses. 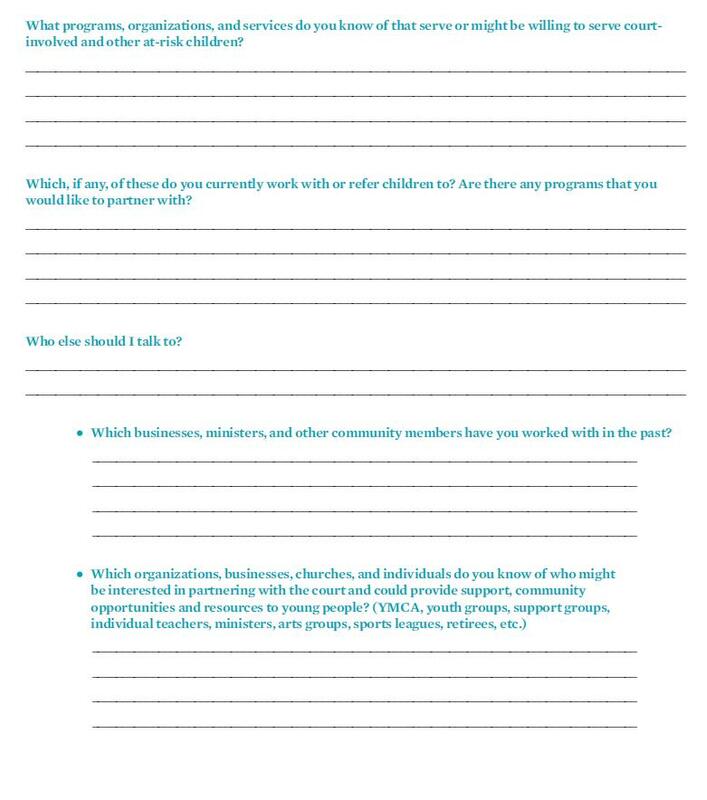 The guidebook will refer back to the answers you have listed here as you discover and unlock community-based assets that can be re-directed to serve children. 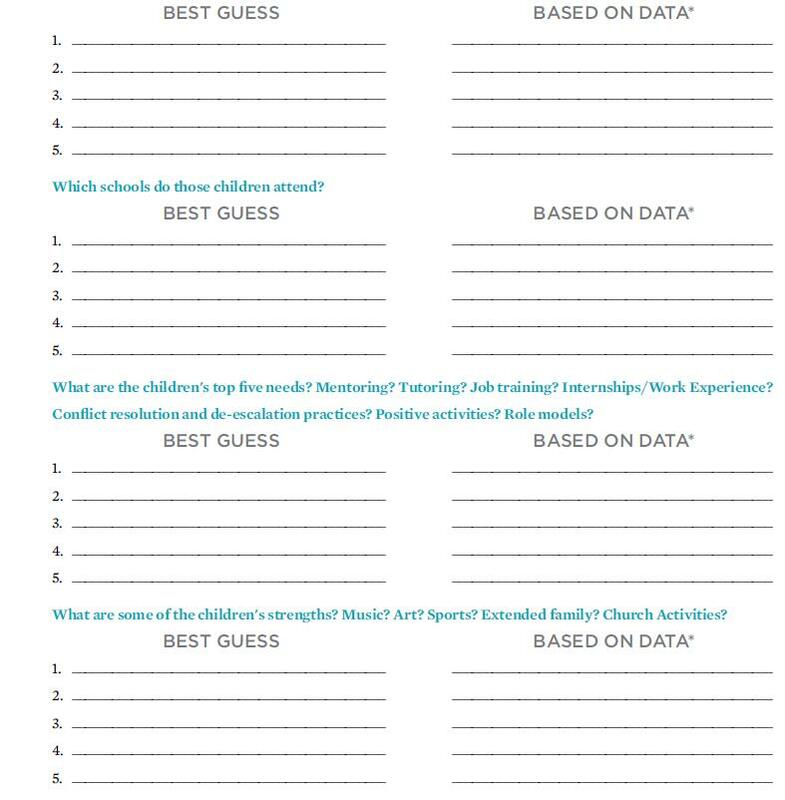 Your answers will help you place tutoring and mentoring activities in schools with the greatest need, and pursue partnerships with pastors and other community leaders in the neighborhood where they will have the greatest effect. Where do the children who face the most risks live? Use neighborhood names, ZIP code, or any other description that works best for your community. For this question, you may want to ask which ZIP codes have the highest numbers of delinquency complaints, which schools have the most students receiving subsidized lunches, which neighborhoods have the highest percentage of residents who rely on public assistance, etc. *Helpful data sources include Alabama Resource Management System, the Alabama Kids Count Data Book, or your local juvenile court, which may have already compiled much of this data as part of an application for Department of Youth Services funding. Common Ground Montgomery is a Christian-based ministry dedicated to assisting children and youth during the most vulnerable times in their lives with an array of after-school and youth-based programs. Common Ground takes a three-pronged approach: 1) staff live in the same communities as the youth they serve, 2) relationship-based programs geared to developing youth character, social skills, and life skills, including academics, arts, sports, and entrepreneurship; and 3) mentorships with youth beginning at fourth grade and continuing through high school. Bryan Kelly, who founded Common Ground with his wife, Delta, was inspired by working in the Ninth Ward in New Orleans the summer after Hurricane Katrina hit the city. The lessons learned there help him and Common Ground to draw support from the youth, their parents and ministries in the community it serves. This section of the guidebook gives you a head start on mapping and discovering. It will put you in contact with many members of the community who are already involved in activities for children, as well as centralize much of the knowledge that already exists in your professional network. The SURVEY phase of community asset-mapping is where you ask the people around you for their input in helping to identify groups in the community. Parents, pastors, family court staff, and other leaders you know are extremely knowledgeable about their communities. They are familiar with many of the organizations that serve children, and can be valuable resources as you move forward. There is no sense in re-inventing the wheel, so this section helps you capitalize on the knowledge at your fingertips. There are a number of ways to learn from the people around you, whether they are friends, ministers, colleagues, or family court staff. You can ask for information and conduct surveys via e-mail; you can mention your project at a meeting and distribute hard copies of surveys; or — and this is the best option — you can have a series of conversations, either over the phone or face-to-face. 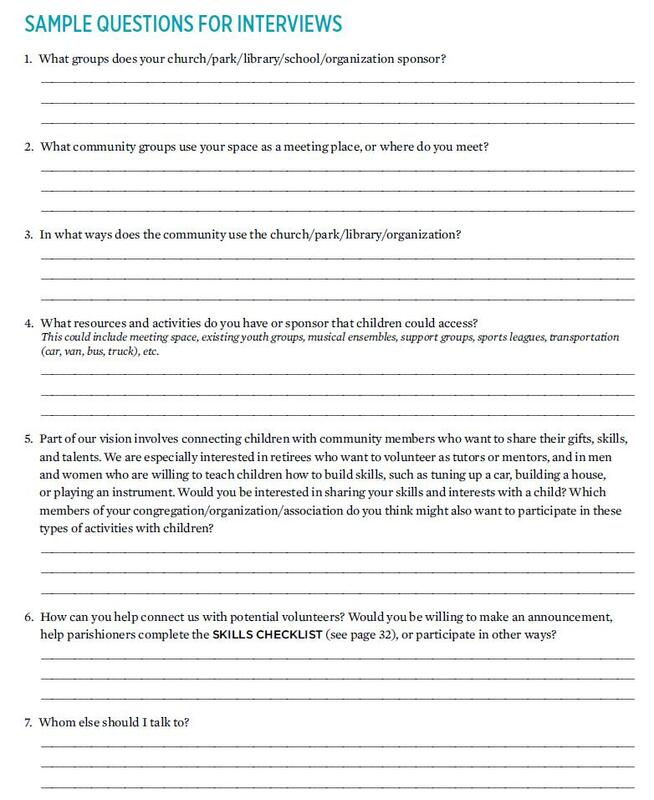 The SAMPLE SURVEY on page 15 gives you a list of questions and a sample introduction to the project of community asset-mapping. No matter which method you initially use to get this project rolling, there are a few general rules you should follow throughout the community asset-mapping process. Community asset-mapping is not exactly a household term, so you will need to explain to the people you talk to why you are asking for this information, and why their input is valuable. Tell them that you are working to connect children who need services with organizations, groups, and individual volunteers who will tutor, mentor, and work with children in their communities. The goal is to build a network of adults who volunteer their time and contribute their knowledge, skills, and passion to positively impact children. As members of the community who are already active in initiatives that benefit children, your interviewees are a valuable resource in beginning this project. When asked an open-ended question with several answers (such as “Which associations are in your community?”), most people will recall only the answers that are clearest. As an interviewer, you will only scratch the surface of your community’s network of associations. However, if an interviewer asks follow-up questions (“Are there associations for women? Sports teams? Fishing clubs? Neighborhood groups?”), the additional context forces the person answering the questions to think a little harder. Once you get started, you will also be able to prompt people with stories from other interviews. Which organizations, businesses, churches, and individuals do you know of who might be interested or enthusiastic about working with children? Youth groups? Community theater organizations? How about First Baptist? Have you worked with Jerry Smith? Asking these types of follow-up questions — and asking about specific people — will invite more thorough responses. You may get a tip that someone is unavailable to talk, but that he or she has a relative in town who is already organizing a volunteer tutoring project. 3. Be disciplined about organizing the information you collect. It is vital to have an organized way to collect the responses you will receive. Before you begin talking to your friends and colleagues, be sure to develop a method of collecting information. A spreadsheet or other form should be easy to understand and simple to add to. Spreadsheets like the EXPLORATORY SPREADSHEET in this guidebook can be valuable and will help others quickly grasp the nature of the organizations you have identified. At this stage, do not worry about filling in every box — you will be able to do that as you interview the leaders and directors of these groups — but get as much information as possible from your friends, colleagues, and any other contacts that come to mind. 4. Get into the habit of circulating the information you have collected and asking for updates. Once you have collected the information in a spreadsheet like the one in this guidebook, circulate it to the people who participated in your survey. Ask them if they have thought of any other community assets that should be included, or what other advice they might have. Previous asset-mapping efforts have found that people remember more the second time around, and that participants give more and more valuable information when they see the information that others have contributed. If you use Facebook or a similar networking site, you may want to post your spreadsheet online to make it available for others to review and update. Now that you have a list of a few organizations that serve (or could serve) children, it is time for you to begin to make contact with them. Different ways of contacting the leaders of the organizations you have identified will be useful in different contexts. Making phone calls, meeting face-to-face, and writing letters are all useful ways to learn more. When you make additional contacts add them to your EXPLORATORY SPREADSHEET. If you are ready to begin making contact, skip ahead to the Reach Out subsection of DISCOVER. If the SURVEY phase does not provide you with a list of promising contacts, the DISCOVER phase certainly will. At any point, you can loop back to the beginning of the DISCOVER section to scoop up the organizations and associations you don’t know about yet. Community leaders are the bridge between you and potential volunteers. They are the glue that establishes the connection between community members who want to work with children and the children you serve. Background: I’m helping with a project that seeks to connect children who need services with the people, organizations, and state agencies that can serve them within their communities. We hope to partner with community groups, churches, and individuals to develop tutoring, mentoring, job training, and other programs for children. Our goal is to build a network of adults who volunteer their time and contribute their knowledge, skills, and passion to positively impact children. We are asking for your input because you are familiar with the organizations that serve children in our community and can connect us with the leaders of these organizations. Alice Westery, center, is a social worker with the Department of Human Resources in Jefferson County, Ala., responsible for identifying housing, employment, and independent living opportunities for youth transitioning out of the foster care system. She’s also a tireless advocate for homeless youth, and serves on various boards dedicated to eradicating homelessness. Pictured with Westery are members of the Birmingham Living Independent National Youth Group (BLING), an organization that includes youth formerly in foster care or who were homeless now working to provide housing for other youths in need. 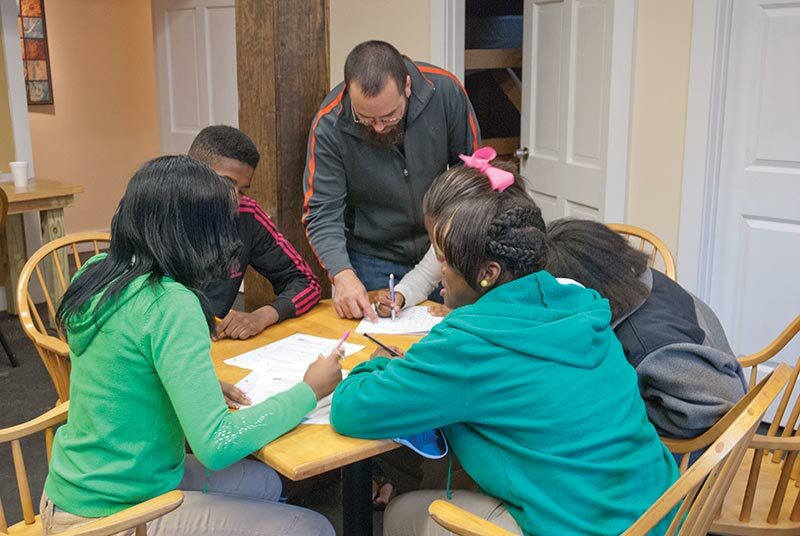 Westery helped BLING to make Youth Towers, a Birmingham facility for homeless youth that offers shelter, life skills training and work readiness preparation, a reality. The DISCOVER phase of community asset-mapping helps to identify the additional groups, associations, and organizations that your friends and colleagues did not know of. Through reading the paper, surfing the internet, going to where groups meet, and interviewing community leaders, you will discover youth groups, music and dance troupes, support groups, service organizations, and countless other resources that can serve children effectively and efficiently. 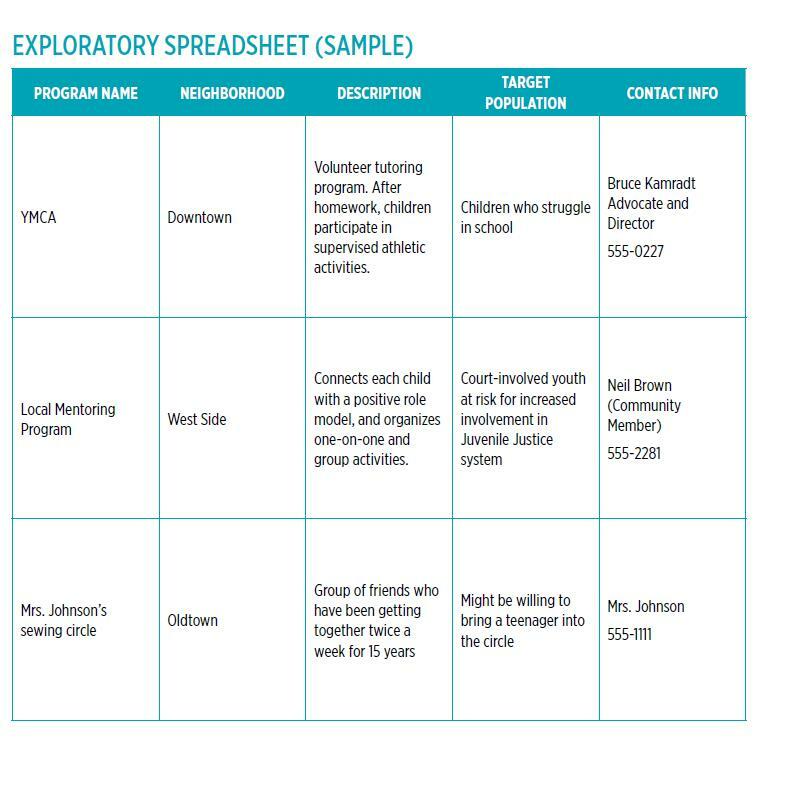 As you dig deeper to discover more organizations and associations that can serve children within the community, you will want to focus on the neighborhood you identified as high-impact on the LOCATION SHEET. It is in these neighborhoods where need is greatest. It is also in these neighborhoods where community members will best understand the challenges children face and will be most motivated to step up and do something positive. As you collect information, add it to your EXPLORATORY SPREADSHEET. As you make contact with community leaders, you will need to graduate to more detailed FACE SHEETS to collect your information. Mining documentary sources is one of the most efficient ways of discovering what organizations and associations exist within a community. 1. Start with your local phone book. Your community’s phone book is the most straightforward place to begin discovering its organizations and associations. Scan the Yellow Pages categories for Associations, Children’s Services, Clubs, Education, Human Services, Organizations, Schools, Social Service Organizations, and Youth Organizations. 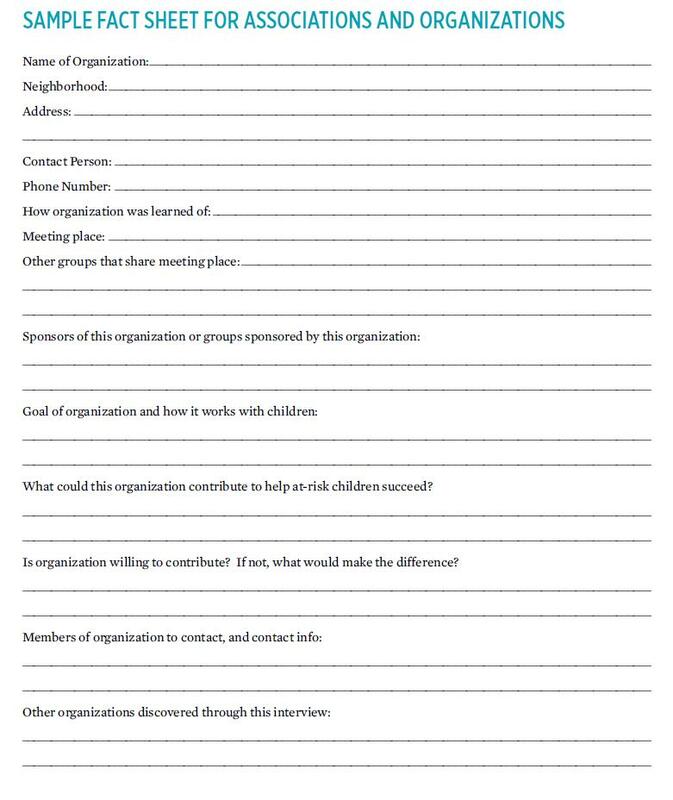 Identify any groups that look promising, focusing particularly on organizations that are located in or near the “high impact” communities you identified in the Fact Sheet. Read your local paper — the more local, the better — for listings of events, meetings, and clubs. Community groups often place notices of their activities in a local paper. You are likely to find information about classes being sponsored by the local Chamber of Commerce, acting and drama groups, or musical groups that cater to young people. Also look for organizations where children could volunteer or provide community service. You'll be surprised at what you can find. Don’t forget the online version of the newspaper; many event postings now appear solely on a paper’s website. The website al.com has a link called “Local Businesses,” and then click on the “Community & Organizations” category, and you can search or browse to organizations, groups, and churches that may be useful. Its ability to map the location of every organization or church makes it easier to pinpoint those in your high-impact area. Also browse categories like “Education & Instruction,” as well as “Adult, Career, and Continuing Education.” In some larger cities and towns, Craigslist may also prove a valuable resource. Career centers, community colleges, libraries, and social service agencies are all assets that are found in many communities and should be included in your results. Community groups typically meet in public places, and these places often maintain lists of the groups and individuals that use their space. Call the directors and administrators of local parks, libraries, schools and churches to ask which groups meet there. While you do not need to contact every meeting place, be sure to contact the high-impact schools you listed in your LOCATE SHEET, as well as any parks and recreational facilities that are in high-impact neighborhoods. Continue expanding the EXPLORATORY SPREADSHEET, adding the promising organizations you find by investigating documentary sources and going to where groups meet. Did a friend or colleague recommend this organization? Is the organization located in or near the neighborhood or school you are focusing on based on the data you collected on the Location Sheet? Does this group do something particularly relevant, something that meets the needs or addresses the strengths you listed on the Fact Sheet? You will always be able to (and should) loop back and make contact with groups lower on your priority list, but definitely begin by contacting the groups that seem the most promising. REACH OUT Relationships are the backbone of successful community-building. Relationships are best established by making phone calls and conducting face-to-face interviews. A letter can be a great way to follow up on a first meeting. Call — Don’t be shy! Call the community members you have identified. See the GUIDELINE FOR CALLS AND INTERVIEWS and the SAMPLE QUESTIONS (page 31) for advice on how to introduce your project and what questions to ask. Make sure to tell them you are calling because someone recommended them as a valuable resource. Also be sure to introduce yourself and the project in a positive light. If someone seems as if they would be particularly valuable to the project after a phone conversation, ask if they would be willing to meet face-to-face. Interviews — the most powerful tool in your community asset-mapping toolbox. Meet with community leaders to discuss your vision of positive community-based programs for children and to listen to their visions for their community. These meetings will provide the best opportunity to brainstorm ways to collaboratively turn visions into realities. One of the most powerful, inspirational, and effective ways to communicate is through story telling. Share your stories about the children you’ve worked with and the obstacles you’ve seen them overcome because they had someone who cared. Stories allow people to see you and your project through a personal and sympathetic point of view. Through stories, people can begin to see themselves — and their own children — in the children you are trying to help. The more your interviewee identifies with you or your children, the more likely they are to become active participants in the project of community asset-mapping. Explain who you are. Introduce yourself and the organization(s) you represent. Tell them how you learned of their activities and why you are interested in what they do. Explain what you are doing. Explain the project. Talk about the project’s goals — to connect children with people in the community who can teach, tutor, coach, mentor, or to simply spend time with children and do something positive and interesting. Take the time to share any stories of success you have had. Describe some of the organizations you have contacted, and what sorts of tasks they have volunteered to do to help children. Explain to the person you are recruiting why their input is so important. They can also help discover and provide the supports that children from their communities need in order to stay in school and stay out of trouble. The community asset-mapping process relies on the knowledge of community leaders to learn about the groups within your community, and the willingness of community leaders to serve as a bridge between you and potential volunteers. They are the glue that establishes the connection between community members who want to work with children and the children you serve. The success of community mapping efforts is built upon your relationships with these respected community leaders. If you are lucky enough to find a community leader who wants to help you with the asset-mapping process, take them up on it. Give them a copy of this guidebook, brief them on what you have already accomplished, and share the information you have already collected. Make sure you have a system to regularly check-in with each other and share information. John Paul Taylor is based in Birmingham, Ala., and is one of the co-founders of Real Life Poets, Inc., a non-profit community service and mentoring organization that focuses on mentoring young adults, encouraging good communication, and the development of oratorical skills using spoken word poetry and the arts. Taylor and his seven siblings were in foster care after his father died and his mother could no longer manage financially. He turned to poetry as an escape. Eventually, his mother reunited the children, and six of the seven graduated college. Taylor, after he was laid off from his corporate job, decided to return to his true love — and give back to the community at the same time. In August 2006, he, along with Leroy “Obeah” Hicks and David “Quick” Hawthorne, formed Real Life and began using poetry as a means of expression and communication to change lives. Real Life Poets now has a multitude of partnerships to spread the power of poetry. Taylor’s organization, for instance, teamed up with the Jefferson County Library Cooperative to sponsor a high school poetry competition called Word Up. A program called First Saturdays at the downtown branch of the Birmingham Public Library is ongoing. The UNLOCK phase of community asset-mapping is where you meet with individuals, collect information about their skills, talents, and gifts that they want to share with children in their community. Unlocking is when community members step off the sidelines and become the tutors, mentors, art teachers, and volunteers who make community-based programs a reality. The most difficult part of Unlocking is establishing contact with potential volunteers. Past efforts have called random households in the community, stopped people on the street, or gone door-to-door to ask about residents' skills and desire to contribute. These methods have met varied levels of success. If you feel they would be successful in your community, the book Building Communities from the Inside Out, by John Kretzmann and John McKnight, is an excellent source for ideas and techniques. Because few community asset-mapping projects have the resources or personnel to conduct door-to-door surveys, this guide recommends targeting by association. Targeting by association means that you will contact and reach out to individuals through the connections you made with organizations in the Discover phase. You will rely on the ministers, directors of organizations, and other community members you have met to connect you with potential volunteers and assets. One place to find people where you can do group asset-mapping is voluntary associations such as neighborhood groups, cultural clubs, self-help groups, recreation groups and sports leagues that you think may be friendly to your initiative. 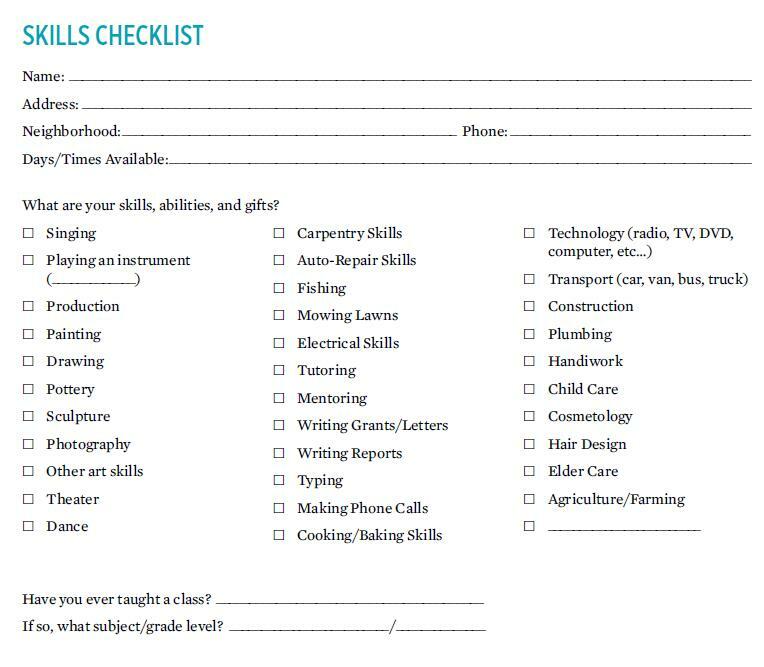 The SKILLS CHECKLIST is a tool that helps identify the skills, abilities, and gifts that community members have to offer. Although it is most effective in group settings, you can administer the Checklist in person or over the phone, or you can distribute copies and let community members complete it independently and return it to you. If you distribute the Checklist and ask community members to complete it independently, be sure to include a letter or memo that explains your project and why you need their input. As you go through the SKILLS CHECKLIST, you are likely to find that many community members feel intimidated and deny that they have skills, abilities, and gifts that would be valuable to children. Whether this hesitance is based in modesty, fright, or a lack of confidence, these people do have gifts to offer children. You must be creative as you combat people’s instinct to downplay their value to their communities. The SKILLS CHECKLIST is most valuable if it is filled out in a group setting. People often feel uncomfortable talking about their personal assets and many people are automatically suspicious that people will steal their ideas. But once a few people in a group begin to share their assets, it encourages others to do the same. This works not only with individual residents but also with organizations. When one organization says it will share its space and its people, others tend to follow suit. At this point, you have completed most of the legwork of community asset-mapping. You should congratulate yourself and your partners for discovering the wealth of organizations, churches, and associations that serve children, as well as for establishing contact and learning about the skills of several individuals within your community. As you achieve small successes, word of your project is likely to spread. You will be able to revisit the SKILLS CHECKLIST and conduct additional interviews of community leaders. In the meantime, you should move on to putting community-based networks into action. Now is when the fun of connecting the dots begins. Some community-based programs will be ready-made: choirs, youth groups, and community support groups require very little start-up on your part. Your role is simply to begin referring children to these groups and to ensure that they are expected and welcomed. Other types of community-based programs will require significantly more energy on the front end, but this is a creative and inspiring process. Getting community-based programs up and running is a lot like putting together a puzzle. Every person and organization brings a small piece, and your task as the puzzle builder is to condense all the pieces into coherent and beneficial activities. A writer in California, David Eggers, recognized that many children would benefit from a community-based tutoring program, and set out to create a network of volunteers to meet children’s needs. He mined the community for volunteer tutors, a cheap and accessible space, volunteers willing to renovate the space, and teachers who would refer children to his tutoring center. He was able to find all the assets he needed and put them into action, forming a tutoring non-profit that is now active in seven major cities (see 826national.org). Like Eggers, you will work from the top down as you first envision a particular program, and then search your SKILLS CHECKLIST and FACE SHEETS for the assets you need to make this program a reality. When an asset-mapper looked through all the information she had collected and brainstormed the possibilities, she realized that state agencies and volunteers she surveyed could complement each other to build a themed program. A local career center offered classes to become a mechanic, a local resident wanted to teach children how to tune up a car, and a local body shop was willing to take on apprentices. Between these three assets, she established what amounted to a course in a subject many children were interested in. She did not begin the community asset-mapping project to create a program built around car repair, but capitalized on the circumstances she inherited. Keep your eyes and mind open, and jump on any opportunity that presents itself. Offer to accompany a potential community volunteer to their first tutoring or mentoring experience. Once people begin this type of work, it quickly becomes less intimidating, and people can overcome their fears. If you can persuade someone to volunteer once, there is a solid chance that you can transform them into a lifelong contributor. The most difficult part is usually getting them to take the initial step. The Epilogue is yours to write. You may have established a network of mentors, or placed tutors in the classrooms of struggling schools. You may have opened youth groups and music ensembles to children who never could have participated otherwise. Your community asset-mapping project may have resulted in an innovative program that benefited hundreds of children, or it may have had a life-changing impact on only one. And this is just the beginning. Tell the story of your experience discovering and unlocking community-based programs for children to others. Be in it for the long haul, and guide others along the path with you. Everything you learned and achieved in this process will inspire others, and, through your stories, community-based programs for youth can spread like wildfire.